Hebron–Dozens of were injured Friday 2/25 when Israeli forces threw sound bombs and assaulted demonstrators at a large peaceful protest commemorating the Ibrihimi Mosque massacre, calling for the opening of Shuhada Street, and criticizing the American veto of the Palestinian call for UN Security Council condemnation of and a halt to settlement activity. The protest was organized by Youth Against Settlements. Thousands of Palestinians and dozens of Israeli and foreign activists along with a number of Palestinian leaders (among them the Governor of Hebron Governorate Kamel Hamid, member of the Fatah Central Leadership Committee Jamal Mahsin, Head of the Palestinian initiative Mustafa Barghouthi,) participated in the demonstration after Friday prayers. The demonstration proceeded from the area of Sheikh Ali Al-Baka Mosque in the city toward the direction of Shuhada Street in the center of Hebron. The protesters split up to try to enter Shuhada Street through alleyways and smaller streets. 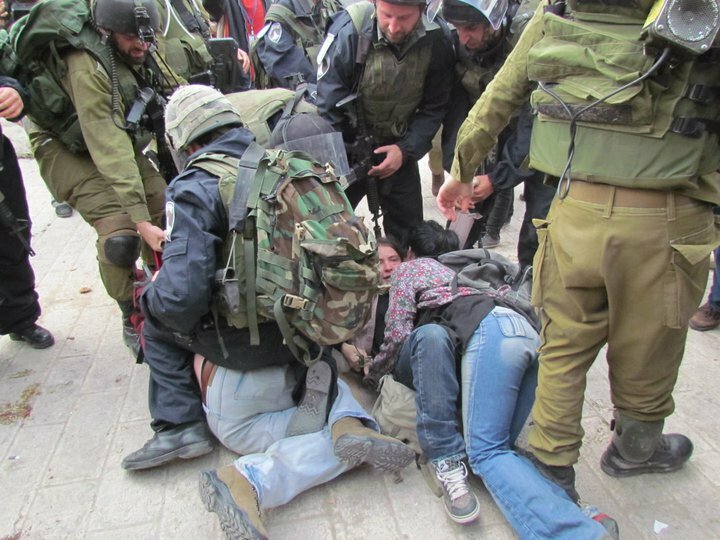 They confronted occupation forces who used excessive force against them. Occupation forces fired gas and sound bombs and rubber bullets at demonstrators, leading to injuries. About 20 demonstrators were taken to Hebron Governmental Hospital. 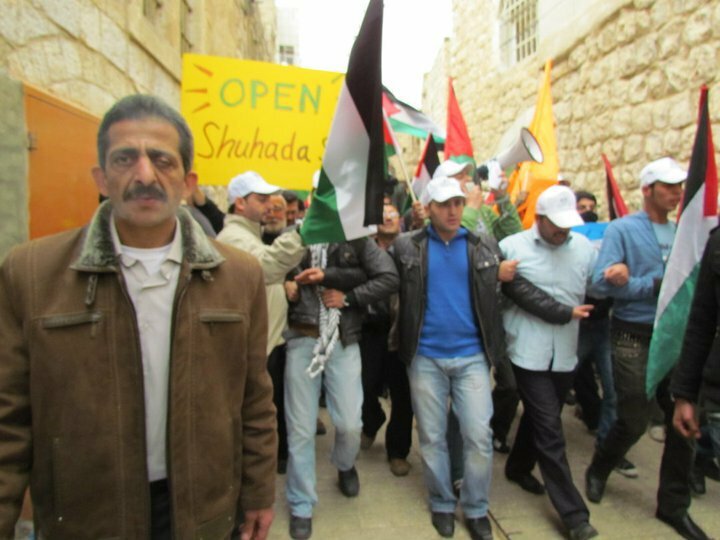 According to Amro, the demonstrators chanted slogans and carried signs in Arabic, English, and Hebrew demanding from the occupying authorities the opening of Shuhada Street, which has been closed for many years. Demonstrators’ slogans praised the popular revolutions in Egypt, Tunisia, and Libya, and criticized the American veto of the UN Security Council condemnation of settlement activities. Hebron Governor Kamel Hamid spoke to those in attendance, confirming the Arab nature of the city of Hebron and the opposition to the policy of settlement and discrimination practiced by the occupation in the city. He called for supporting and strengthening popular resistance to the occupation. He condemned the US veto in the Security Council. Jamal Mahsin spoke also, praising the steadfastness of the residents of Hebron, and emphasizing the necessity of national unity and the end of internal divisions. The Israeli occupation forces closed Shuhada Street to Palestinian vehicles in 1994, after the Ibrihimi Mosque massacre, then forbade Palestinian residents to walk there in 2000, in order to provide security for the 600 Israeli settlers occupying the center of Hebron. More than 500 stores were closed by military order in the center of Hebron, and more than a thousand store owners were forced to close their shops due to checkpoints and closures. At the same time, illegal settlers enjoy freedom of movement in the closed streets and are protected by occupation forces. 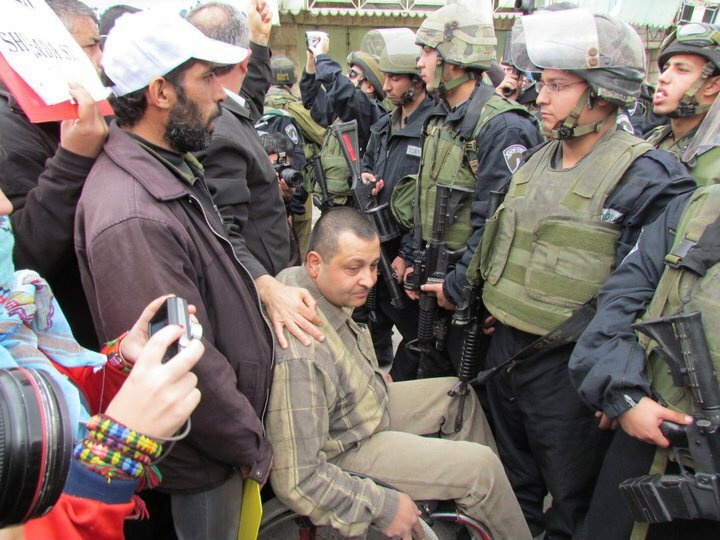 The activities of the occupation and its settlers in the city of Hebron have turned the lives of 200,000 Palestinians in Hebron into a living hell and expelled thousands from their homes.